Meet a young star destined to be “an influential tenor saxophonist in jazz for decades to come” (JazzTimes). 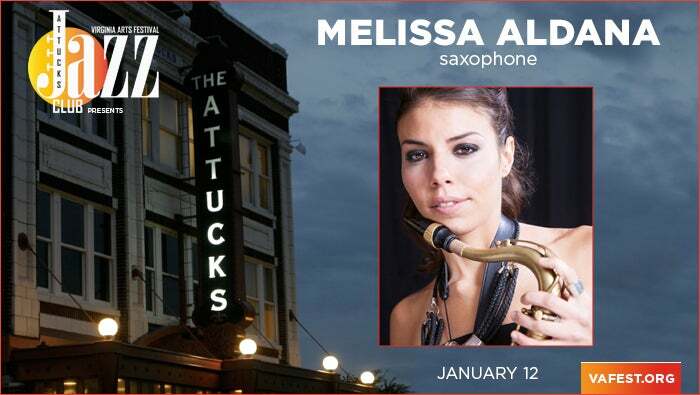 Melissa Aldana began playing the saxophone at age six, studying with her father, an accomplished saxophonist who competed as a semifinalist at the 1991 Thelonious Monk International Jazz Saxophone Competition. (Melissa herself would go on to win first place at the Thelonious Monk International Jazz Saxophone Competition, becoming the first female in history to win a Monk instrumental competition.) Starting on alto, Aldana absorbed the language of jazz by listening to and transcribing music of jazz greats including Charlie Parker and Cannonball Adderley. After hearing Sonny Rollins perform, she decided to switch to tenor; by her early teens, she was frequenting jazz clubs in her hometown of Santiago, Chile. After meeting Panamanian jazz pianist Danilo Pérez, Aldana received an invitation to perform at the Panama Jazz Festival and was later accepted to the Berklee College of Music in Boston. Today, Melissa Aldana is a sought-after soloist and ensemble player, performing with Wynton Marsalis, Peter Bernstein, Christian McBride and Jeff “Tain” Watts, and at major festivals including the Barcelona Jazz Festival, Copenhagen Jazz Festival, Monterey Jazz Festival, and more. Get your tickets for an evening of “richly melodic improvisations…high-grade stuff” (Chicago Reader) at the Attucks Jazz Club!